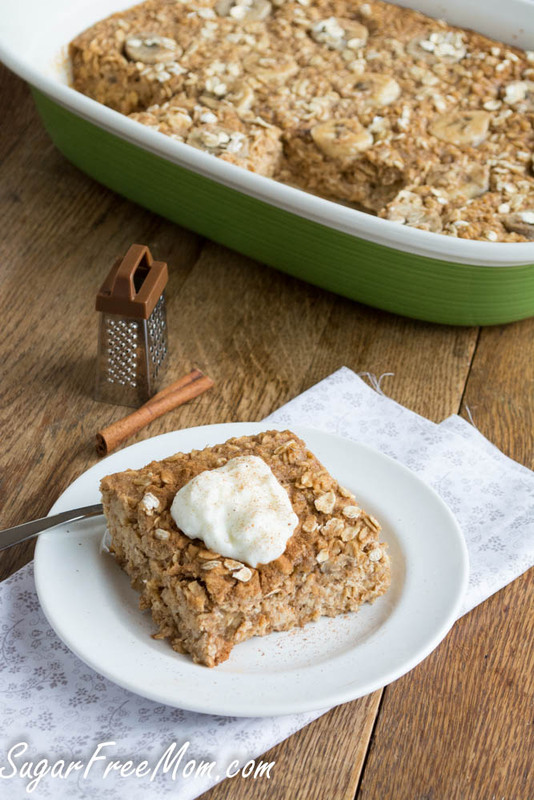 This Refined Sugar-Free Baked Oatmeal is a winner sweetened with coconut sugar and applesauce which makes it moist and nutritious! This recipe originally posted Oct. 19, 2011 and was my very first recipe to be published on this blog! Today it’s been updated with new pics and some revisions, only slightly as the original is still the best! 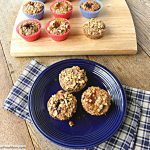 Because of this recipe I then created the recipe that took my blog global and went viral early on and which is still my highest traffic source to this day, published back in Feb. of 2012, Personalized Baked oatmeal cups! 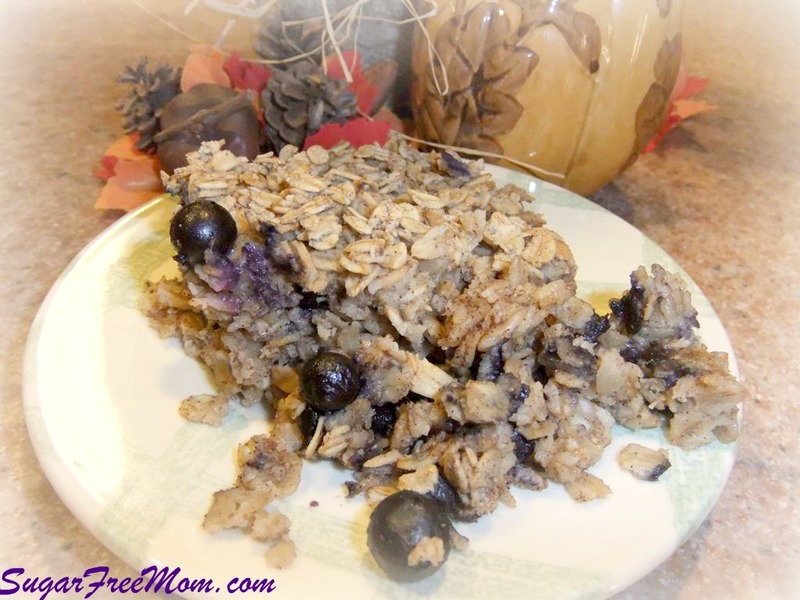 The original recipes adds 1 cup of blueberries, but this time I just used bananas, so it’s a Banana Baked Oatmeal. You can certainly add in whatever fruit you love, peaches, strawberries, raspberries, just be sure to drain after washing or thaw and drain if using frozen. Seen here topped with some Greek yogurt and a sprinkle of cinnamon! And now I am revealing the very old pic I decided to keep just to encourage you if you’ve just started blogging. Taking pics daily makes a big difference and eventually it all comes together for a great drool worthy photo! 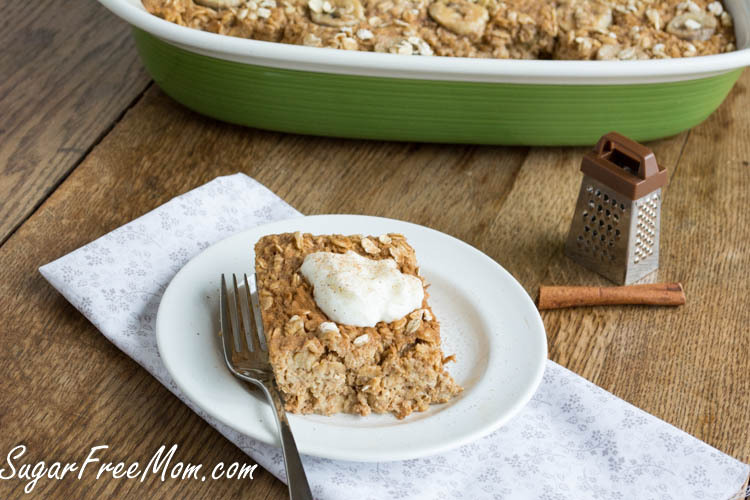 New And Improved Baked Oatmeal! This recipe came from my sweet friend in PA who says it is an Amish recipe. SO really no idea who originally created it. The problem was it was delicious, but loaded with high calories! It originally had a cup of sugar and almost a cup of oil!!! 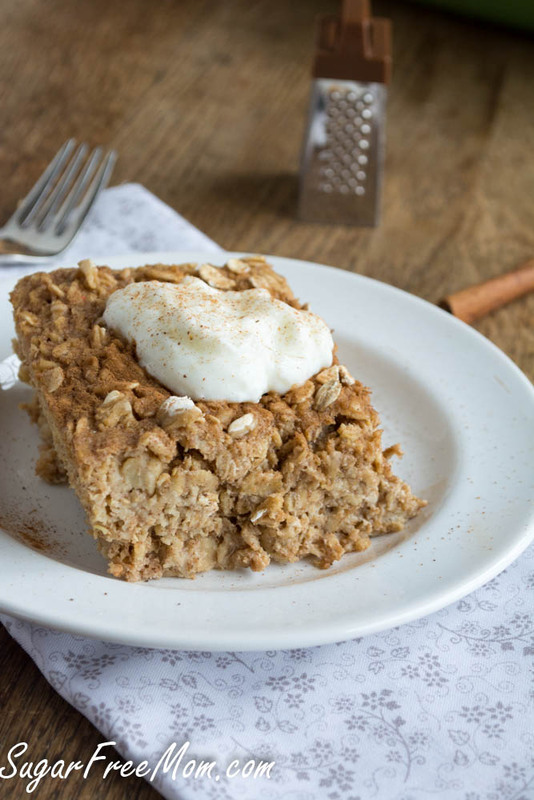 I began experimenting with my new favorite sweetener Stevia and came up with an average baked oatmeal, but it wasn’t outstanding. 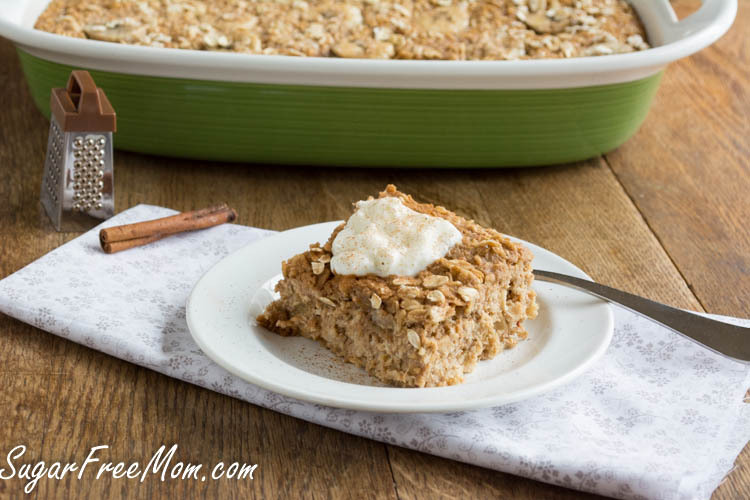 Unfortunately, (MY BAD) some of you may have made the first Baked Oatmeal I posted. I am dreadfully sorry about that since now I have completely perfected this dish and I hope you will forgive me just this once. I Promise to never, ever again put up a recipe I am not completely smitten with! So on the ingredient sides I switched the oil for applesauce and took out the white refined sugar all together and replaced it with a mix of Stevia in liquid form and Sucanat, another favorite sweetener I adore. You could alos use honey in replace of the sucanat. You can even reduce the calories more by using water in place of my milk, but I don’t think its as delicious. This recipe is LARGE and great for overnight guests! It can be prepared pretty quickly and even the night before if you so choose. This recipe has become a big hit on Pinterest, but did you know I’ve adapted the recipe to be completely sugar free as well as portioned controlled?? 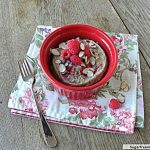 It’s true, check this one out: Personal Sized Baked Oatmeal with Individual Toppings to please the whole family! I subbed the sucanat for coconut sugar since I had none left, both just as tasty and delicious, kid and hubby approved! The original recipe used 1/2 cup of sucanat , I reduced it to 1/4 cup and subbed coconut sugar in its place. I left out the blueberries and added another 2 banana’s. I added flaxseed meal where the original had none, and increased the applesauce to compensate. Everything else remained the same! Mix first four liquid ingredients together. Add sucanat. flax and oats. Mix the salt, baking powder and cinnamon in a bowl then pour into the wet and mix well. Add the milk, mix thoroughly. Add the fruit gently to the wet mixture. Pour the mixture into a 9 x 13 baking dish sprayed with cooking spray. You can use 1 cup of honey or a full cup of sucanat if you don't have Stevia, but I highly recommend buying the vanilla creme Stevia. The five full droppers of Stevia is about a teaspoon. So maybe one packet of Truvia would be enough? It really isn’t a very sweet dish, you may have to adjust after you make it once. We like it with the amounts as is, but you may prefer it sweeter. I do not use Truvia so its hard for me to get more specific with you.Hope I helped though! I made this recipe in the crock pot. Turned out great!!! I used the fruit I had on hand, and it was the best oatmeal we’ve had! Thanks! I used Agave Nectar. My husband is a type 2 diabetic, is Sucanat safe to use? Sucanat is less refined that white table sugar and is more natural but just like honey is still a form of sugar. You could eliminate it all together and use stevia which is completely natural and sugar free and it may be just enough sweetness. You could skip adding any sweetener in the baking and simply add sweetener of choice after its baked. Hope that helps. Thanks again for giving out what looks like an amazing recipe! I am wondering if you can mix this up the evening before and bake in the morning. ? I hope I didn’t miss that answer somewhere. Hi Heather, I actually haven’t tried to mix all ingredients the night before and then bake in the morning. Its a good idea and I don’t see why it wouldn’t work. Please let me know how it comes out! I made these and they are fantastic. Thank you! 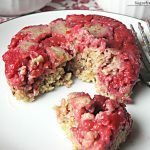 I made the oatmeal muffin recipe and it was fabulous! It’s definitely one of our favorites now! I use almond milk due to a milk allergy and it was super! I am bringing breakfast to work on Thursday morning and wanted to make one big oatmeal bake (that will serve more). I have about 20 people and will be serving fruit and milk on the side to pour on top as well. I was thinking of making one 9×13 of this recipe and then two 9″ rounds (and maybe doing different additives: blueberries/nuts/craisins). I’m thinking of taking the milk out, since you noted that option, even though it doesn’t taste as good, and then serving it to my daughter and family with almond milk poured over the warm oatmeal bake. 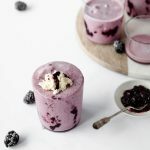 Do you think that would make up the difference in taste or would you recommend trying this recipe with the almond milk baked in as a better option? Sorry for such a huge comment! I love your website! Thanks so much! Using water would be ok, but using the almond milk would be so much better for the creaminess aspect! Thank you for such sweet words! I appreciate it! And one more question – have you tried frozen blueberries? I was thinking they might sink to the bottom, but then the oatmeal is a lot denser than some recipes so I thought I’d ask! Thanks again!! Actually I usually use frozen!! Just let them thaw a bit before adding to batter. I have never tried to fill the pan over. Its so very moist and dense not sure how it would work. I think if I were to try it I would insert some parchment paper in the dish then spray or grease it. If you leave enough parchment on the sides you could use it to maybe lift it up and out? Possible but haven’t tried it so let me know how it goes! WOW – Amazing!! I added flax seed , and topped one with nuts, but they turned out amazing! 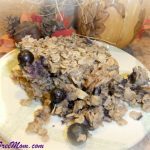 Between these and the muffins, I guess the ingredients are just proportioned differently and blueberries added, but it’s very moist and turned out great! We’re in love. I’m going to try these into muffins next time. Thanks so much!! Has anyone made this using egg beaters instead of the eggs? Wondering how it turned out. If you could that would be great to cut back on more calories. I’m so glad! Yes you could use honey or brown sugar if you like. This recipe is fabulous!! I added some chopped peaches to the fruit mix and topped it with chopped walnuts – YUM! This was one of my first recipes using stevia and i wasn’t sure if my family would like it with just stevia so that is why sucanat is in there. It has a more brown sugar type taste but it certainly can be eliminated and you can just use stevia. One teaspoon of liquid stevia equals a cup of sugar. LOVE this recipe !! Have made it several times !! I make it w/ the 1 C honey, I use 1/2 oats and 1/2 steel cut oats and instead of milk, I use unsweetened vanilla almond milk (bet the sweetened version would add a lot more richness) :-p and let is set for 1 hr before baking it !! OMHeavens, it is wonderful !!! The steel cut oats adds so much more texture than straight oats !! Thank you for sharing the awesome recipe !! Those changes sound wonderful, thanks! I’m glad you liked it! Thank you so much for this recipe! I was working with what I had in the cupboards and ended up substituting a can of pumpkin for applesauce and banana….4 of my 5 family members LOVE it…the 5th one doesn’t eat much of anything. Delish! I want to add brewers yeast to it. How much do you think i should add? Delicious! 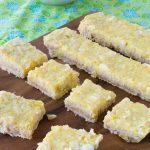 I cut the recipe in half (baked in an 8×8 – still made a huge batch!) and omitted the sweetener. I decided it had enough natural sweeteners with the applesauce, banana and berries. I also used vanilla soy milk rather than regular milk. It was outstanding! I am going to divide the remaining oatmeal and freeze for future breakfasts. 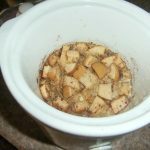 This is the second oatmeal recipe of yours I’ve tried (crockpot pumpkin oatmeal). 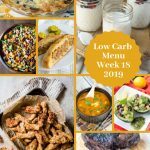 Thanks for your delicious and healthy recipes! I wish you would combine the recipes that you have listed on those 3 different links. One doesn’t say in the instructions when to add the banana, one doesn’t even have flaxseed listed in the ingredients….this caused me some trouble making this my first time. 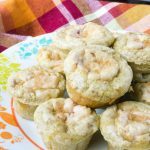 Love the recipe and I can see why it’s so popular, it would just really help if you listed it a little more clearly on this main “muffin” recipe link!! I’m sorry. It was one of my very first recipes on my blog and so poorly written. I’ve just fixed it up a bit so hopefully that helps! Can you replace the milk with yogurt? If so, Would it be the same amount, or more, or less? I’ve not tried subbing that but it sounds like a good idea! I love this bread! I have found you can put just about ANYTHING in it and its still good! Today, I am baking it with peaches along with the blueberries! Oh, and I add walnuts and pecans too! I also add ground flax seed. After its baked, I freeze it, bag it up in individual servings and its breakfast for me for two weeks! Im so glad I found this! 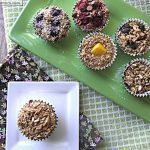 I was so excited to see an oatmeal muffin recipe – until I read the ingredients. Do you have any W/O bananas. I can’t find one anywhere. I love oatmeal and nuts, apples and fruit, honey and all things good for me except Bananas. They are just too gross to eat – even when camoflagged in other foods…in fact, banana usually overpowers the other ingredients and all I taste is banana. I wish I liked them it’d make eating healthy easier. But I detest them. Can you help? I had to reread the sentence about your first recipe being in Oct.,2011 and the oatmeal cups being in Feb.,2011. I looked and it was 2012. Haha!!! What a big difference in the pic!! I need to try those oatmeal cups. Thanks so much for catching that mistake, I appreciate you! I cut this recipe in half since I didn’t have enough of the ingredients. I didn’t have enough milk, either. I mistakenly bought regular plain yogurt instead of Greek style so I used 1 cup of that and 1/2 cup of almond milk. I also used peaches instead of banana and to my surprise, it turned out great!! I’m new to the whole “healthier cooking” lifestyle, but with seven children and growing doctor bills, I figured I had to try something. I have never used any sweetener other than white sugar and brown sugar so I’m going to try to just punt with honey, as I have no other type of sweetener in my home. 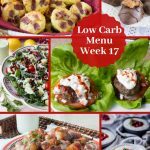 Do you have other sugar free or gluten free recipes? On a side note any advise you have for making healthier meals would be great!! What is an easy oatmeal cookie recipe without brown sugar?